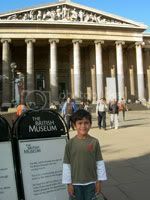 Last month, K* had a day off school so Jenny and I took him down to the British Museum. He's been studying Egypt so we thought it would be good to show him the Egyptian collection, particularly, the Rosetta Stone. I'd forgotten how long it's been since I last went there. It was before they did the big renovation which was years and years ago. It's quite a surprise to see the new interior. Very nice. The British Museum is a fantastic place and its reminded me I really should take the kids there a few more times to explore the other collections. K*'s attention span was good for about an hour and not a lot longer. The gift shop and the cafeteria can hold his attention for longer! Oh well. They will have to be short and sweet trips. We did get to wander around the hallowed Reading Room. It's quite awesome the number of famous people that have studied there but it does feel like a shadow of what it might once have been like. It has an air of a monument rather than a library.